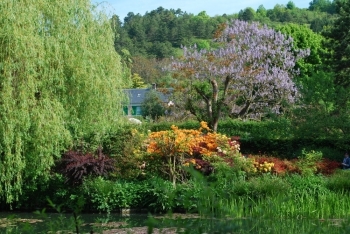 The beautiful lavender blossom of the paulownia in Monet’s flower garden at Giverny harmonizes with the orange azaleas of the water garden, on the other side of the road. The paulownia blooms exactly at the same time than the lavender wisterias gracing Monet’s Japanese footbridge. Is it intended or not? What is a coincidence, and what is due to the choices of a clever gardener? In Monet’s garden, I believe most of the meetings between plants aren’t accidental. Monet, as well as the present day head gardener, was very good at organising dates among the flowers.